Sugar & Spice Children's Market: More fun than a toy shop! More fun than a toy shop! Anyone who drives a car like this just has to ooze fun right? I am very excited that Ffyona and the team from Pass-the-Parcel have come on board to 'bring the fun' to our 1st Birthday Woodend Market. Face painting, balloonology, yes that is a technical trade, music and unique toys will be on the agenda for Pass-the-Parcel to celebrate Sugar & Spice turning one! 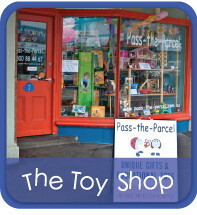 Based in Kyneton, in the beautiful Macedon Ranges, Pass-the-Parcel have been sharing their fun for over 10 years. Their services include; roving performers, event entertainment, face painting; balloonology, mobile kids parties, craft classes, circus and clown skills lessons, music sessions - the impressive list goes on. Headquarters is their cute shop front in Kyneton where they have a strong focus on selling Australian made, green and eco friendly toys. Or make sure you pop into St Ambrose Hall on Sunday June 5 to share in some Pass-the-Parcel birthday fun. Today, Kyneton's Midland Express Newspaper will visit their shop to take a picture to accompany an article about our upcoming 1st Birthday Market, yay!